VALTEC brand produces bathroom equipment engineering – the spectrum of components for heating systems and water facilities. You can find more details on Valtec site. There is a test laboratory by the company. Here the products of this brand and other brands are tested. As the result of tests recommendations on improving quality of products are worked out, and then sent to production facilities. For example, test laboratory executes the quality control of rubber sealers for fittings. In order to do that, different tests and trials are conducted. Among them, microscopy stands out because of its demonstrativeness and relative simplicity. A VALTEC employee contacted us, Altami company. Anton Aleksandrovich brought his samples, and, after they were examined at different microscopes, chose for his work a inverted metallographic microscope Altami МЕТ 1 МТ. It allows to conduct research not only at the bright field are, but also at the dark field, according to simple polarization method. 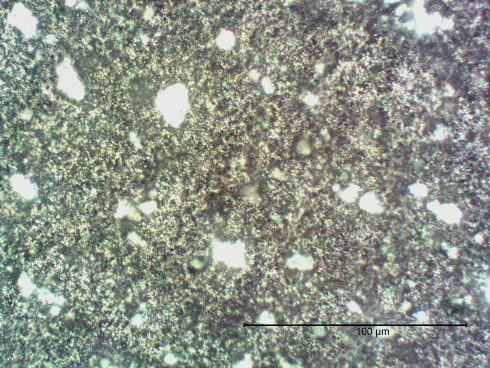 This is necessary by search in the sample for the non-metallic inclusions. As the software we offered to Anton Aleksandrovich the Altami Studio 2.1 application. With the help of application he receives micrographs and performs their visual analysis. Namely: he conducts quality control for ring seal fittings. As our microscopes allow to conduct research in this sphere, we decided to throw light on the problem of the quality analysis of ring seal fittings: goods of different producers differ by characteristics and are not always of high quality. (The author’s note – In this article we will not mention the names of companies-producers; for additional information please contact the employees of the test laboratory). For example, let us compare micrographs provided by Anton Aleksandrovich. In them it is possible to see the cross section of rubber ring seal fittings for joining metal-filled plastic tubes by three different producers. The photos were made by 50х lens with 2592х1944 resolution with using the Multifocus technique worked out in Altami Studio application. The Multifocus tool allows to collect from the images with different focus distance value one image so that all its elements were in focus. In order to receive them, after the first installation of Altami Studio 2.1 application Anton Aleksandrovich made calibration for each lens and resolution of the camera, in order to define the relation of real sizes of the received at the image. Further, through oculars he conducted the adjustment to the necessary image of the defined sample and to the switching of the image from videocamera. With the help of the camera settings and the histogram, he adjusted brightness, contrast, white balance, and so on, according to the image of the sample. Then, with the help of a microscope and Altami Studio application, the Valtec employee conducted quality control of the ring seal fittings. Image analysis was conducted with the help of the comparative visual collation method. Anton Aleksandrovich and us can see that at the first micrograph, illustrating the section of the rubber ring seal fittings of the A producer, there are some inclusions. In the second photo there are less inhomogeneities, here the result of the B company products analysis is presented. “Naturally, the rubber structure should be homogeneous and should not have inner voids. As usual, if a producer has some problems with chemical composition of the product’s enclosure, then contractions look unattractively under the microscope”, – says Anton Aleksandrovich. On this basis, it is possible to make a conclusion that the producer C has the goods of the highest quality, as one can see according to the third micrograph analysis. Altami Studio application is used by the employees of the test laboratory not only for fittings quality analysis, but also for pipe thread identification. In the image below it is possible to see the cutting of the thread fitting for joining corrugated stainless tubes (5х lens). Respective sizes were defined with the help of the special measuring tools of Altami Studio application that’s figures (sections and angle). As it is possible to see in the photo, A. A. managed to define main sizes of the carving. After these measurements, the task was just to identify the carving. For that purpose, great quantity of national and foreign standards, including GOST 24705-2004 (ISO 724:1993) “Basic norms of interchangeability. Metric carving. Basic sizes” and ISO 5864 “Inch spiral carvings ISO. Overmeasure and admittances” has been analysed. After that, a conclusion was made that it is non-standard inch carving with double step. Anton Aleksandrovich presented the result of carving analysis as the report created in Altami Studio application. “As the result of my work I need to present demonstrative and vivid images of objects, that is why such Altami Studio application tool as Multifocus helps me to reach the desired result. And the possibility of measuring with the help of sections and angle is very convenient”, – says Anton Aleksandrovich, a staff-member of the test laboratory of the Valtec company, performing his hard and necessary work.